What Traits Define a Duck? Ducks may be some of the most familiar birds even to non-birders, but what makes a duck a duck? The unique characteristics of these waterfowl are often overlooked and underappreciated, but birders who understand how to define ducks can better enjoy these feathered wonders. There are more than 100 species of ducks in the world, and many of them are uniquely specialized for different habitats, climates, and diets. From eiders, mergansers, and scaups to dabblers and divers, the different types of ducks are intriguing for birders to familiarize themselves with. By understanding what makes ducks unique, birders can more easily identify which waterfowl they see. Ducks are found throughout the world on every continent except Antarctica. They can be found in a range of both freshwater and saltwater habitats, including marshes, rivers, and oceans, but always require some open water nearby. In many areas, foreign species of ducks are introduced to parks and gardens because of their exotic beauty, and in some cases, these introduced species can become invasive and problematic for native ducks. Many ducks are also able to hybridize with other species, which can dilute the genetics of native ducks if introduced populations are not controlled. Ducks have several physical characteristics that label them as distinctly ducks. Feet: Ducks have wide, strongly webbed feet that help them be powerful, efficient swimmers and in many cases, agile divers. The feet often have durable talons that help the birds grip different surfaces on land as well, including slippery rocks and branches, even if their body structure does not support agile walking. The color of the legs and feet can vary, but many ducks have brightly colored legs and feet, including yellow, orange, pink, or red. Bill: A duck's bill is typically broad and somewhat flattened to function as a more efficient food scoop or strainer, though there is great variation in bill shape and size among ducks. Most ducks also have a hard nail at the end of the bill to help them root for food. Slight serrations or a comb-like structure, called lamellae, on the sides of the bill, can help them strain water for insects and other food. Some ducks have very colorful bills, including red, orange, yellow, pink, or even blue. Body Shape: Ducks have a compact body that is efficient for streamlined swimming and preserving body heat when immersed in water. Their legs are typically set far back on their body, which makes them ungainly on land but gives them more power when swimming and diving. Oval body shapes are the most common for ducks, but the proportions of the oval vary from very slender to a plump, nearly round body. Plumage Structure: A duck's plumage is well constructed and thoroughly insulated by design as well as from regular preening. The feathers are so tightly connected that even when diving completely underwater the layer of down feathers next to a duck's skin does not get wet. This provides superb temperature control and prevents the bird from getting chilled even in icy water. An oil-producing gland near the tail also helps ducks keep their plumage waterproofed. Plumage Color: While dimorphic plumages are common for many types of birds, ducks take this to a new art with outrageous, even garish patterns and gaudy colors on males. Females are much more subdued with neutral colors and mottled patterns for better camouflage. When molting and less able to fly, males often look more like females to stay hidden until their feathers are ready for flight again. Not only do ducks have different physical adaptations that make them unique, but their behaviors also distinguish them as a unique bird family. 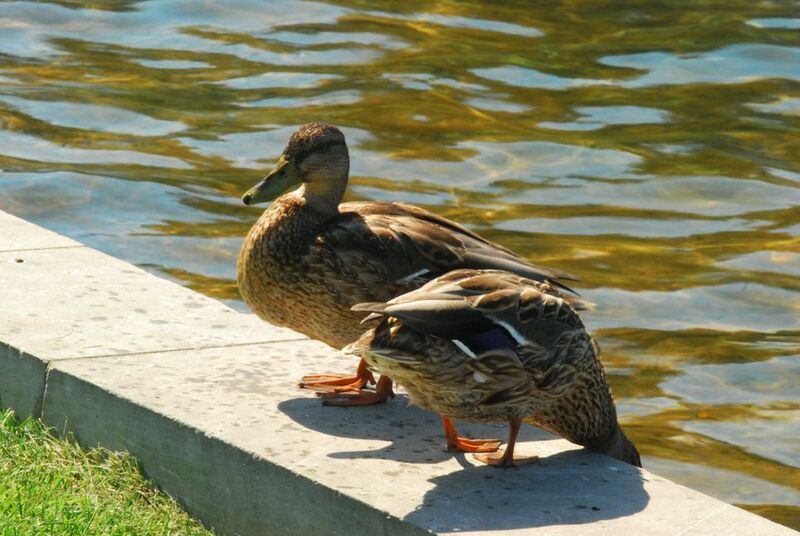 Feeding: Ducks are often classified by how they feed, either as diving or dabbling ducks. Dabblers "tip up" on the surface of shallow water to forage for food as far down as they can reach, while divers submerge completely and swim underwater in search of food at deeper levels. Flight: Unlike many types of waterfowl that require a long takeoff runway, most ducks can take off nearly vertically from either land or water. Their flight is a series of stiff, rapid wing beats and they rarely glide except when coming to land. Vocalization: Contrary to popular belief, very few ducks have "quack" calls, and their range of vocalizations includes whistles, squeaks, and growls. Whereas in most birds the males are more vocal, with ducks it is the female who makes the most noise, though males are equally vocal during the breeding season. Breeding: Ducks hybridize widely and may interbreed with several other duck species. This creates a range of indistinct plumages with unexpected color patterns and odd markings that are not always identifiable. This is further exacerbated by breeding with escaped domestic duck breeds. Each of these birds shares some characteristics with ducks, but they lack all the traits that truly define what a duck is. Recognizing these similar waterfowl can further help birders distinguish what makes ducks unique and noteworthy. Ducks are delightful birds, though they can be easily overlooked by both novice and experienced birders. By understanding what makes a duck a duck, birders can better enjoy these distinguished waterfowl.